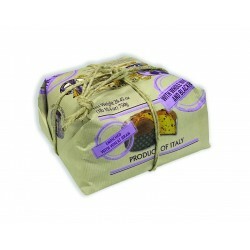 Panettone filled with Limoncello cream, with candied lemon peels, without sultanas; naturally leavened oven baked product. Hand-wrapped in elegant paper. 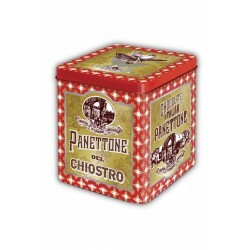 The Panettone Chiostro di Saronno is produced according to the traditional recipe, through a slow and natural leavening and all ingredients, from flour to milk, eggs to butter, candied fruit to yeast, are of natural origin strictly genuine. Wheat flour, fresh eggs, butter (milk), filling cream 13% (sugar, glucose syrup, whole milk, limoncello liqueur 10% (water, sugar, alcohol, lemon infusion 10%), water, flavours, jelly agent: pectin, preservative: potassium sorbate), candied lemon peels cubes and paste 12% (lemon peels, glucose-fructose syrup, sugar, acidifying: citric acid), sugar, fresh egg yolk, milk, natural yeast (wheat), emulsifiers: mono and diglycerides of fatty acids, glucose syrup, flavours, cocoa butter, salt. May contain traces of nuts and soy.